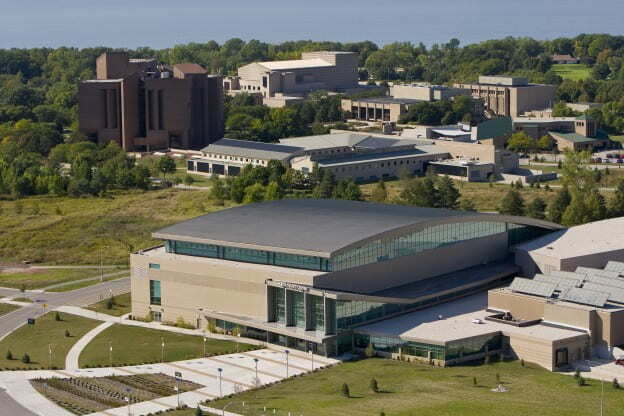 Famous names from Green Bay’s rich history identify several of the University’s signature programs and facilities. The David A. Cofrin Library. The Kress Events Center. Mary Ann Cofrin Hall. The Weidner Center for the Performing Arts. The Cofrin name is particularly prominent across campus. Family patriarch Austin E. Cofrin founded the Fort Howard Paper Co. in Green Bay in 1919. He died in 1980 at the age of 96 after making Fort Howard the world’s largest papermaker. Austin’s son, Dr. David A. Cofrin, and his wife, Mary Ann, struck up a friendship with UWGB Founding Chancellor Edward Weidner and went on to make dozens of contributions including a half-dozen gifts of seven figures or more, across a range of academic fields, nature-conservation projects and fine arts initiatives. It began with the campus arboretum and continued through student scholarships, named professorships, the opening in 2001 of the University’s primary classroom facility, and completion in 2007 of the campus recreation and events center. Most prominently, in 1987 the couple announced a challenge gift (eventually to total more than $5 million) for a public campaign for a state-of-the-art performing arts center they insisted would be named for their friend. The Cofrins later funded construction of a $4.6 million addition to the Weidner Center, completed in 1998. It was a desire to more fully honor the legacy of Austin Cofrin that led Dr. David, shortly before his death in August 2009, to announce a $5.5 million gift to the University. That contribution, the largest single private gift for academics in the history of UW-Green Bay, created a fully endowed chair (an additional faculty position) in business, and funded a permanent, universitywide endowment for faculty development and academic enhancements. Also inspiring by example is another Green Bay papermaking family whose generosity has boosted generations of students at UW-Green Bay. Ground was broken in late 2005 with ribbon cutting in fall 2007 for the University’s state-of-the-art recreation and events center, the Kress Events Center. A generous naming-rights gift from the George F. Kress Foundation pushed fundraising past the threshold to start construction on renovation and expansion of UW-Green Bay’s Phoenix Sports Center at a total cost of $32.5 million. 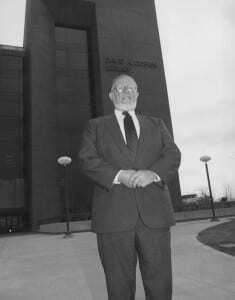 George F. Kress was the founder of Green Bay Packaging Inc. and a longtime supporter of education and other community causes. This entry was posted in Phoenix Phactoid and tagged facts, fundraising, trivia on August 29, 2015 by Christopher Sampson.